My knitting slump continues... Socks started at the beginning of the summer, still aren't finished. I like the design, but I am just not interested in knitting them. Nothing else either. So, of course my response was to start something new.. And while it is pretty, it really won't be a successful FO. 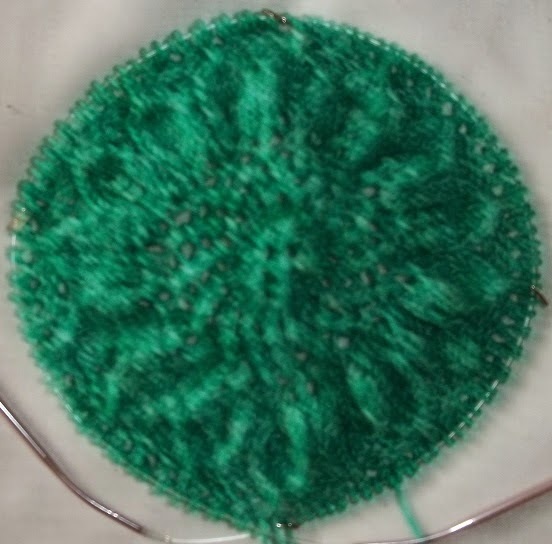 The yarn is a soft wool and silk blend, (no name/no label, bargain cone)--home dyed a mint green. Every new group in the progression is getting a new stitch pattern. 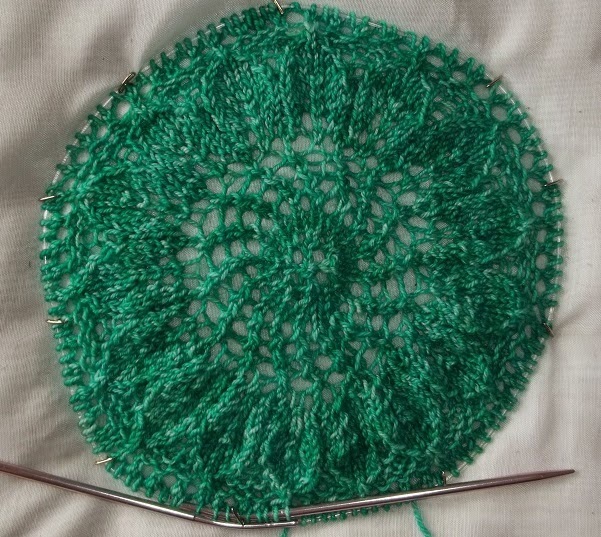 Like all lace it doesn't look like much unless its heavily blocked.. Just compare when I finished the leaves.. (un stretched) with the same bit stretched out on the needle and pinned. I am now ¼ (8 rows) through the 32 row section, and I won't really be able to stretch out the knitting anymore—even just gently (vs hard blocking) stretched, it fill my circ. I mentioned above, that this will be somewhat unsuccessful FO. 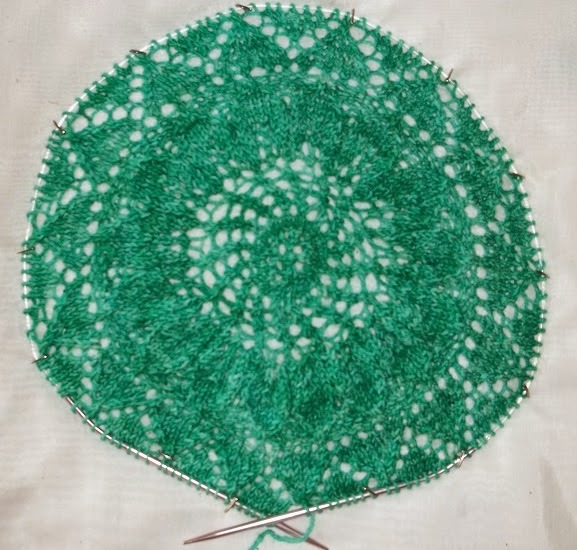 I don't really have enough yarn for a big circular shawl. Just 4 oz or so, (and no idea how many yards)....So I am likely to run out of yarn when the circle is just 20 inches or so.. But it's fun to play with new patterns as I progress—its almost going to be a stitch sampler as much as anything else. I suppose it will be a small neck wrap in the end. A needle full of stitches. I have also been pigging out on TV—I got hooked on Orange is the New Black-- and now I am eagerly waiting for season 3 with thousand of others. Mad Men is on my Netflix queue, too. My baby granddaughters are growing like weeds—and I see them at least weekly—and sometimes 2 or 3 times in a week—what with babysitting, and doctors appointments, and just helping out (library trips). They see their other grand parents on a regular schedule, too. They have a packed social life for infants—DD want to make sure they are not shortchanged in attention or stimulation.